The seven-panel adulterant screen kit for Creatine, Nitrites, Glutaraldehyde, pH, Specific Gravity, Bleach and Pyridinium Chlorochromate. All seven adulterants are detected on a single strip with individual results displayed for each test. 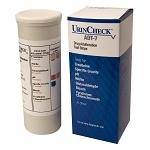 To use the test, simply dip the strip into a urine sample, then withdraw. After 1 to 2 minutes, the test will activate. The test is simple to read and easy to understand.